This concert took us back to a favourite venue, St Botolph’s Church, Shepshed. The concert was in aid of the Shepshed Foodbank. This began in 2014 when it was clear that some families had to walk to Loughborough and back to visit the foodbank at the Carpenter’s Arms. In the four years since then, the Shepshed Foodbank has grown. In 2014 is distributed four food packs and now in 2018 it distributes 38-45 packs of food per week. The evening’s programme was shared with the Concorde Singers, who sang as a group and also as solo singers. Accompanied by pianist Chris Hill, their programme included traditional numbers, songs from musicals and classics from Gilbert and Sullivan. Our first flute, Yvonne Renouf, a Concorde singer as well as respected band member, sang Sting’s song Field of Gold as a solo. She had a very busy night! Audience members who spoke to me afterwards enthused about Concorde’s singing as well as the programme they had chosen. Fortunately for me the same people were equally enthusiastic about the band’s performance! The programme incorporated rousing marches (The Thunderer,) a soothing trombone solo played by Mark Greenaway (Song for Trombone,) evocative pieces such as Galloping Home, and Big Country and the whole evening was brought to a close by American Trilogy. This, the final piece of the evening, demonstrated to all how much Katie Campsall, our drummer and percussionist, has developed in the short time she has been with us, a tribute to her hard work. The whole evening was a beautiful celebration of music. Singers and instrumentalists played their hearts out for a cause that is dear to many. 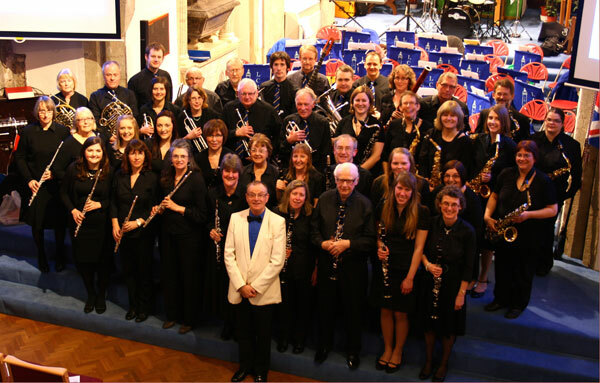 Refreshments were provided by St Botolph’s that were gratefully received by audience members as well as musicians. We are fortunate in the people we have to help us – Dave Coble rehearses and guides us and Eddie Pearson was the compere for the evening, Dave Coble and Wendy Miller set up our seats and the music stands. All we have to do is play! But it’s a real team effort – everyone plays a part in making a memorable evening. We look forward to more of them.